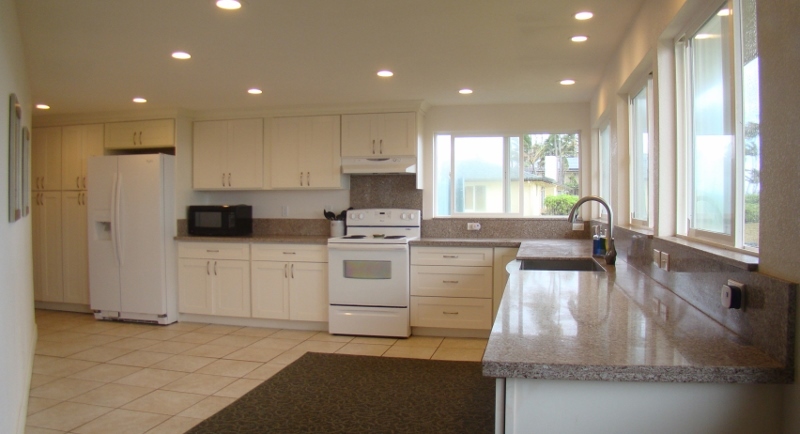 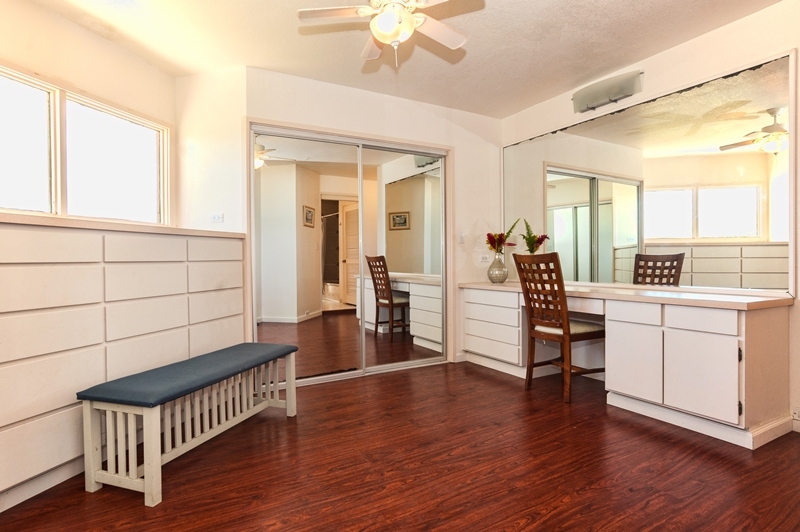 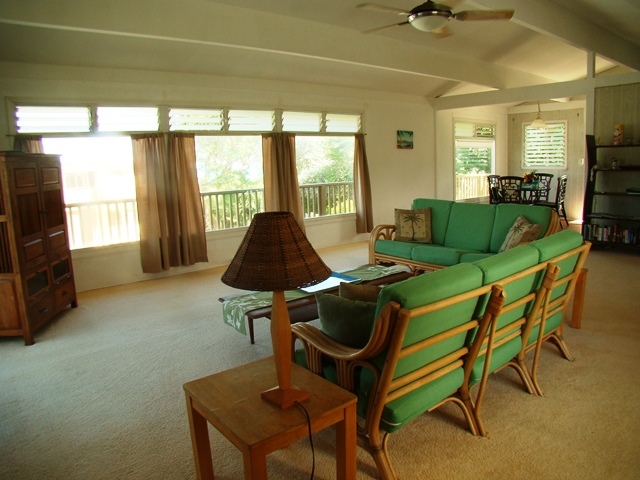 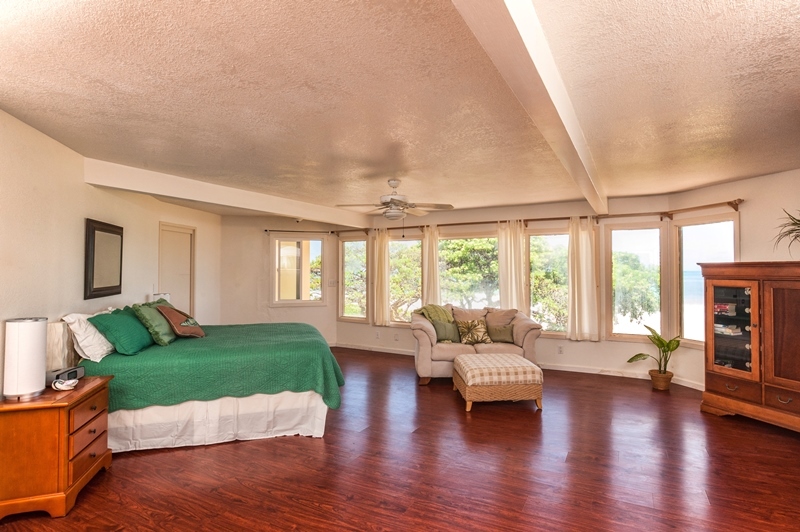 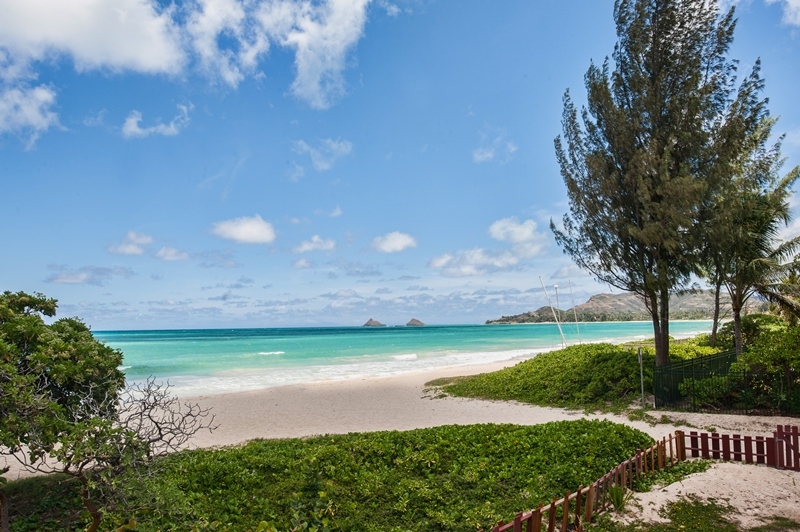 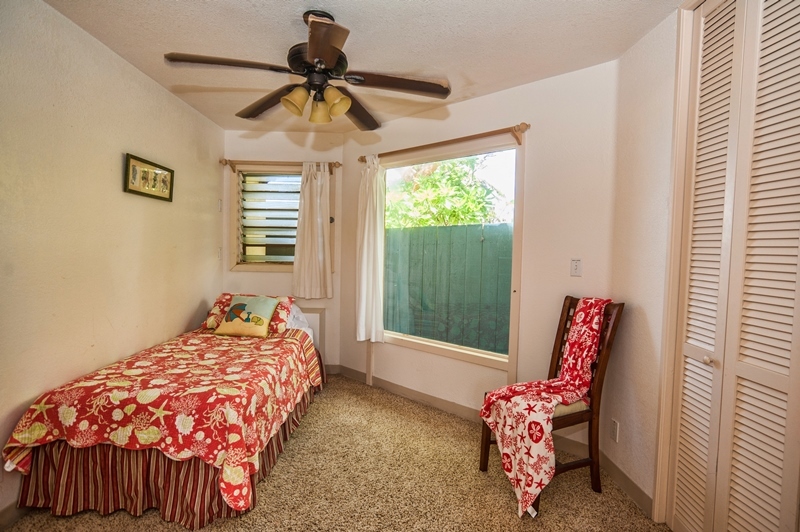 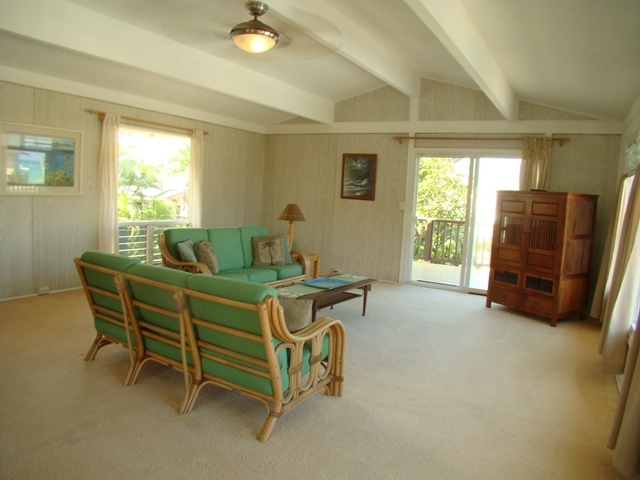 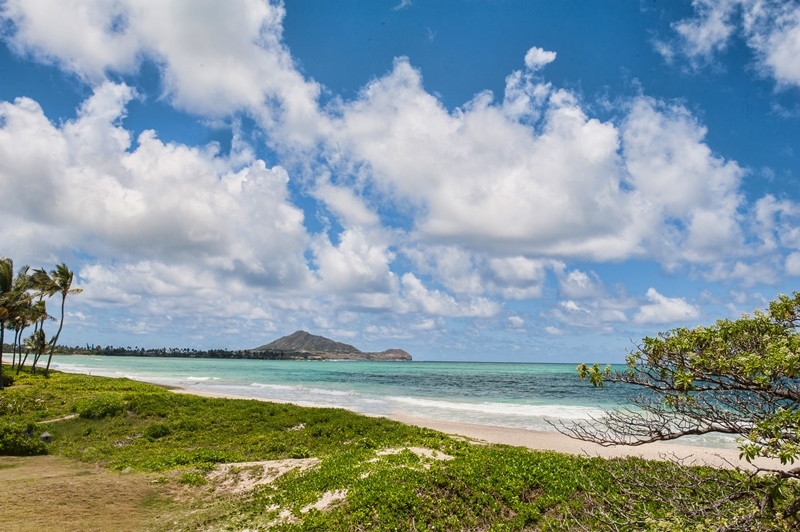 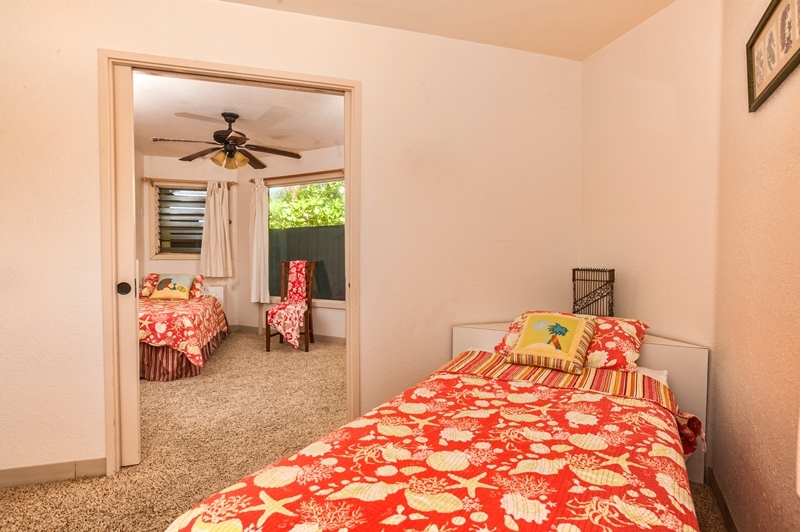 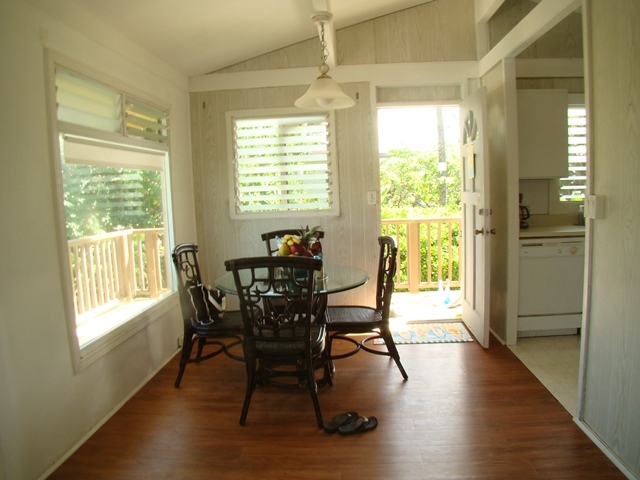 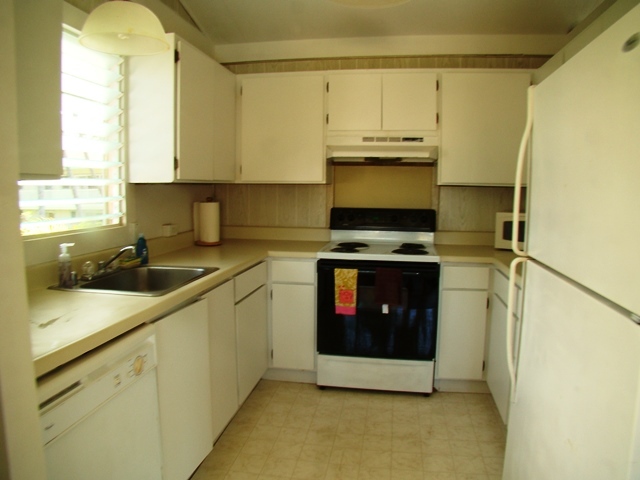 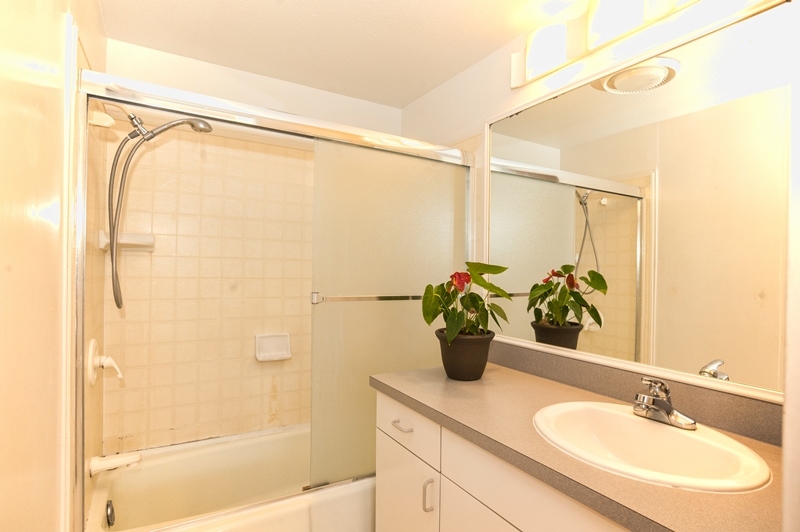 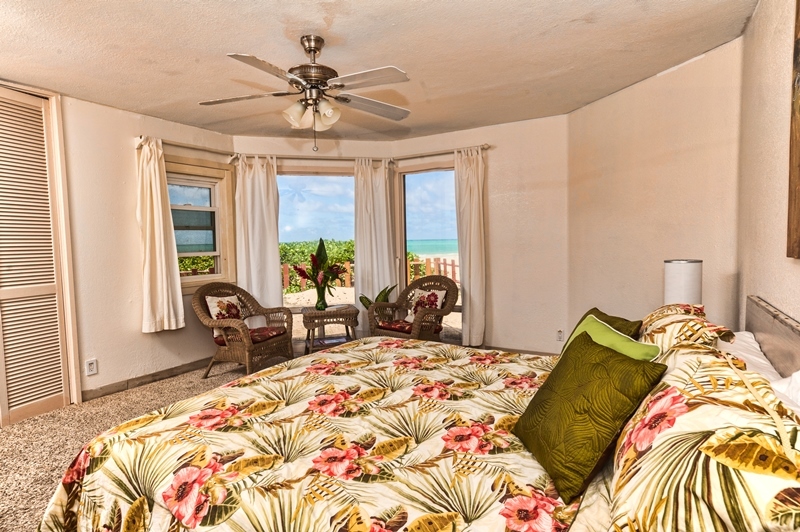 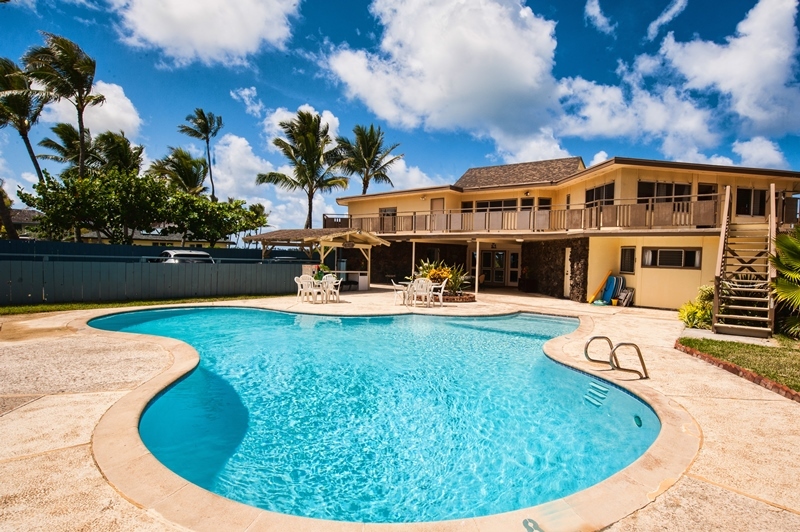 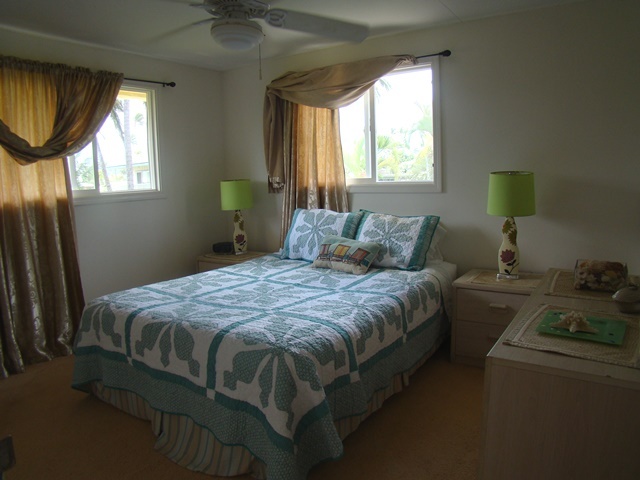 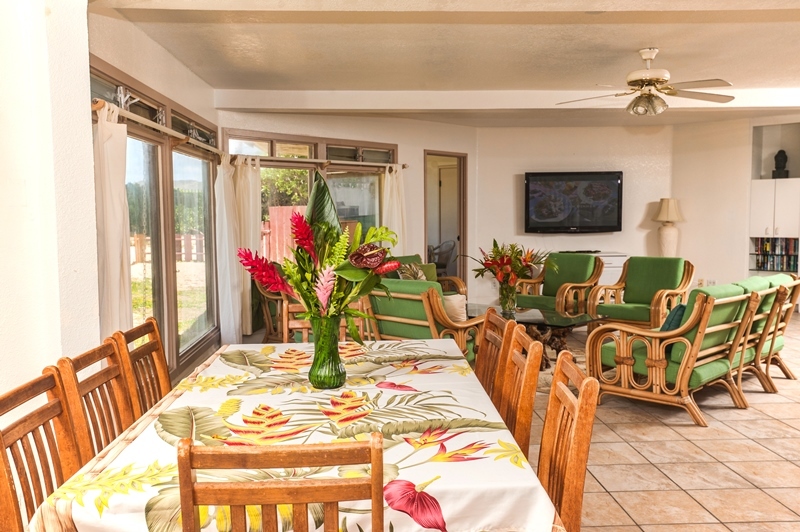 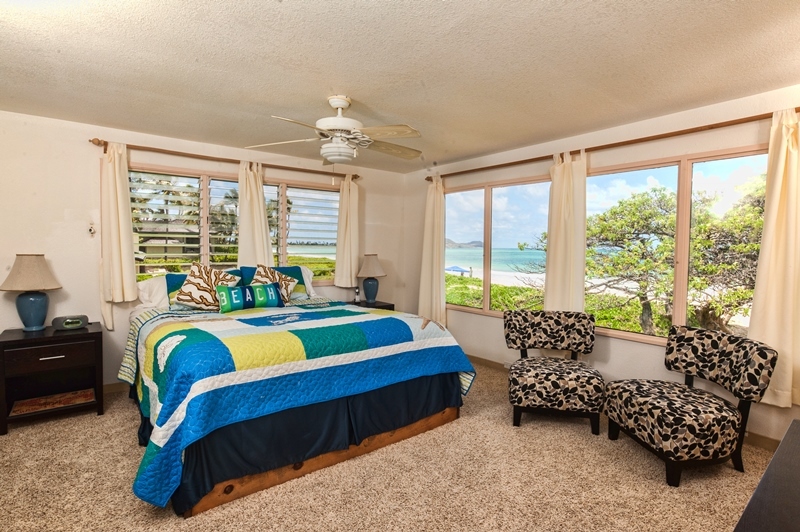 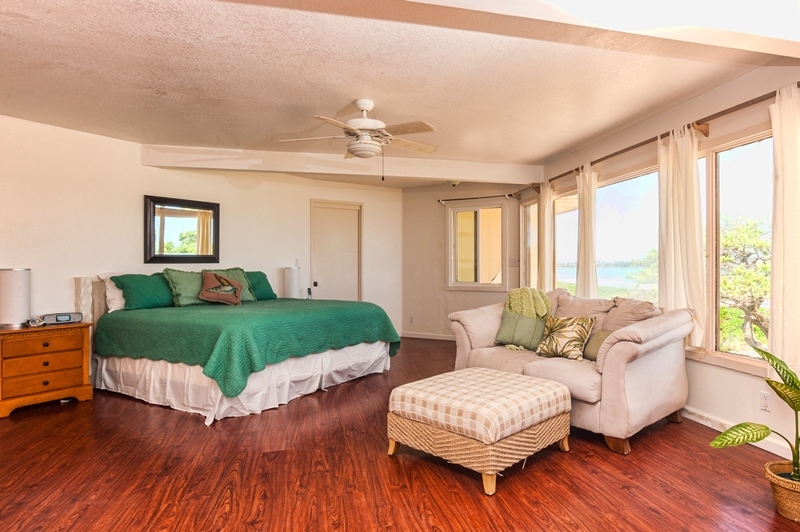 Kailua Beach House with Cottage – Luxury Vacation Homes, Inc.
Kailua Beach House is an original beachfront house with an adjacent cottage house and is a licensed vacation rental. 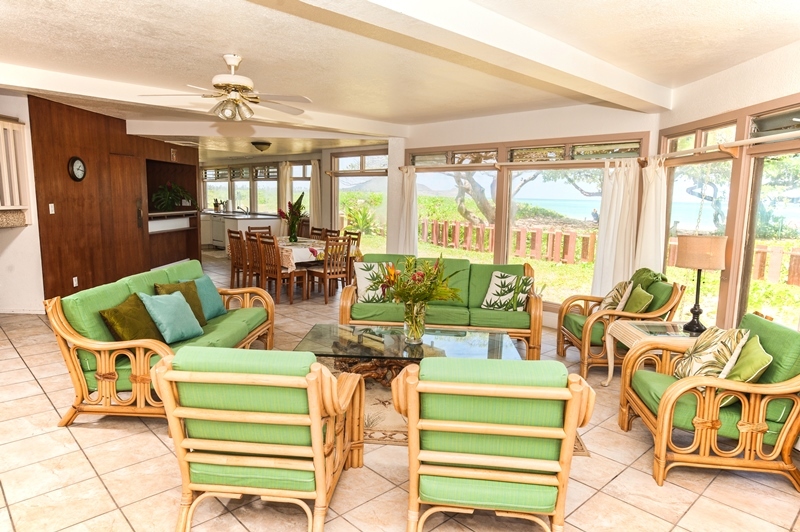 This is a casual, family friendly, two-story 6 bedroom, 4.5 bath beachfront home with 5,000 square feet of living space. 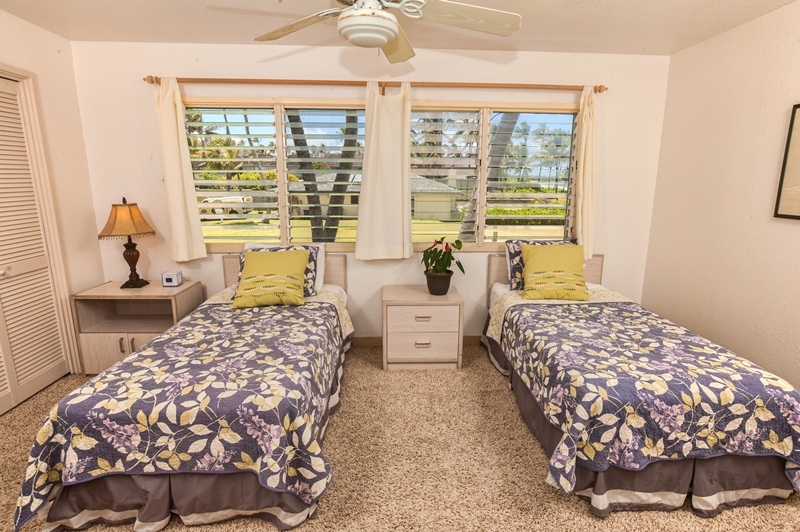 The adjacent cottage offers 2 additional bedrooms and 1 bathroom with 1,000 square feet of living space for a total of 8 bedrooms and 5.5 baths with 6,000 square feet of living space. 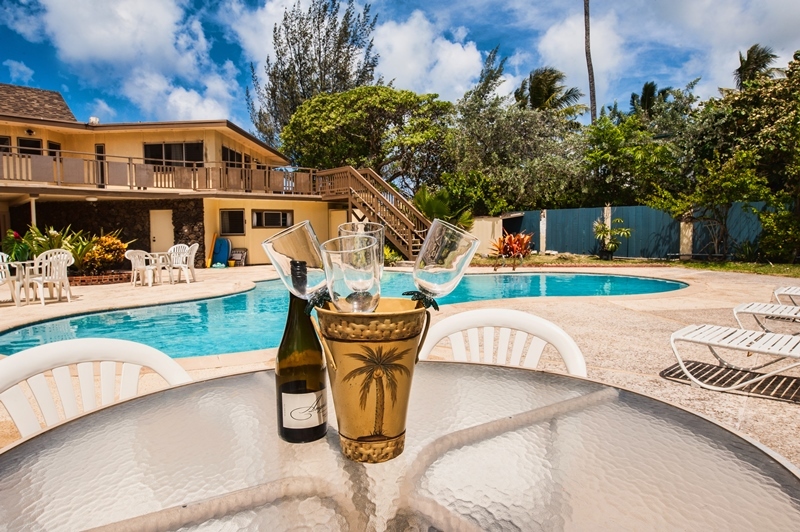 The 1/2 acre privacy-fenced property features a large, free-form swimming pool which has a poolside cabana with a shower and a built-in BBQ. 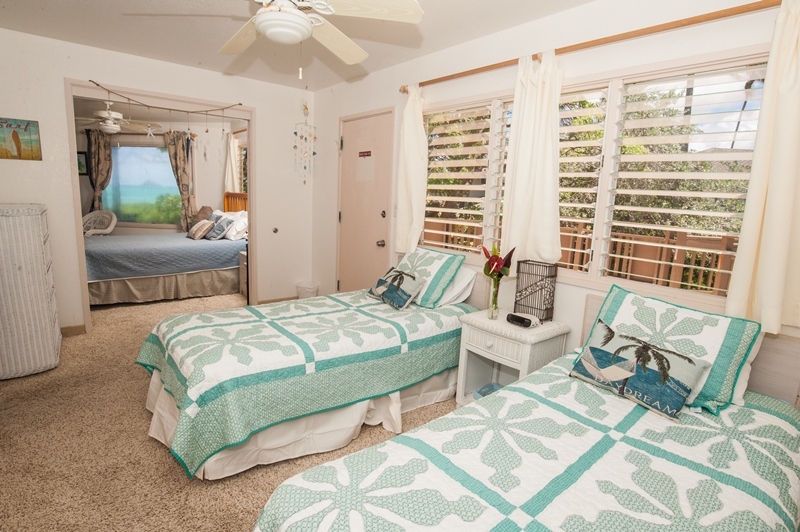 The property decor features light colors, pastels and tropical prints. 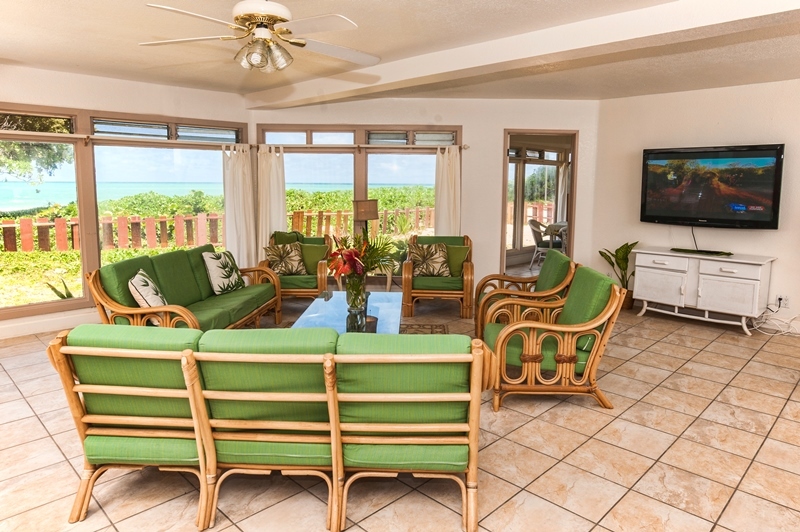 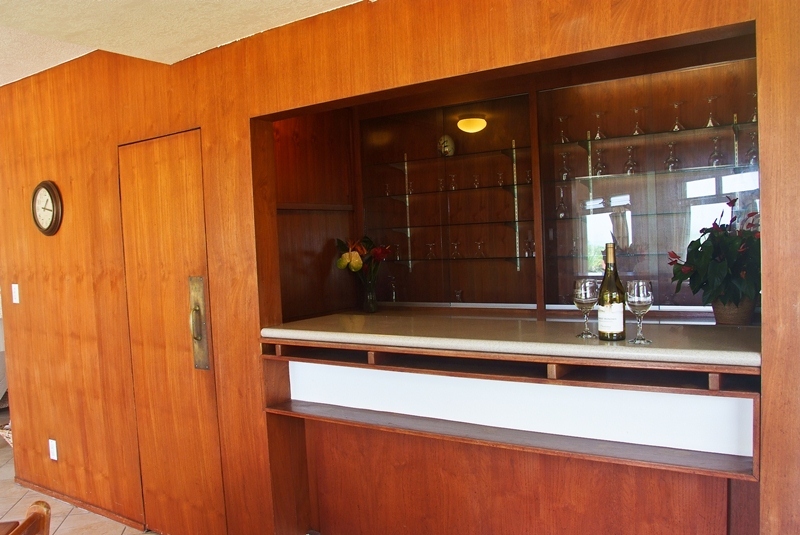 The oceanfront living area has a wetbar, a card room and TV, DVD, and small stereo. 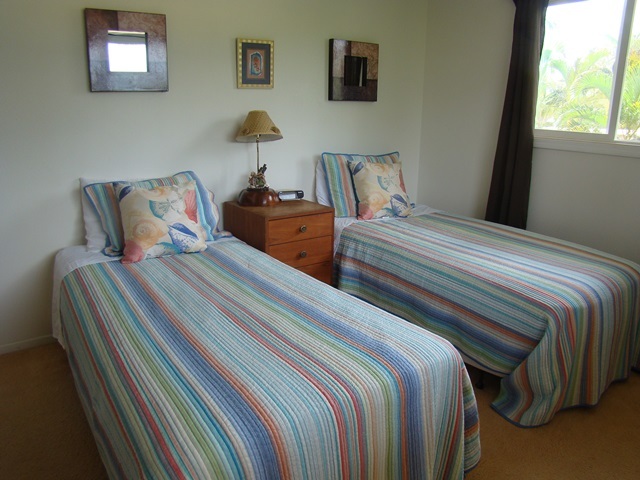 Maximum occupancy of the main house and cottage is 16 guests. 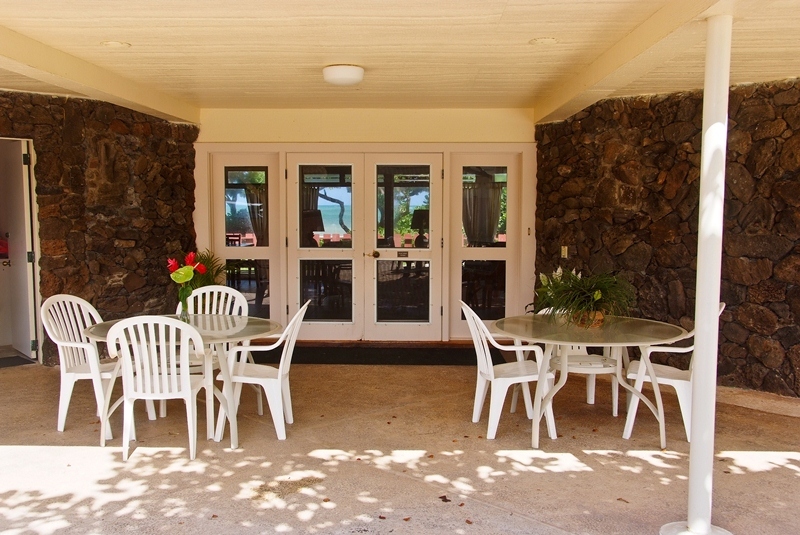 Oceanview dining area in the main house seats 10; Main house breakfast area seats 4; Outdoor poolside dining seats 10+. 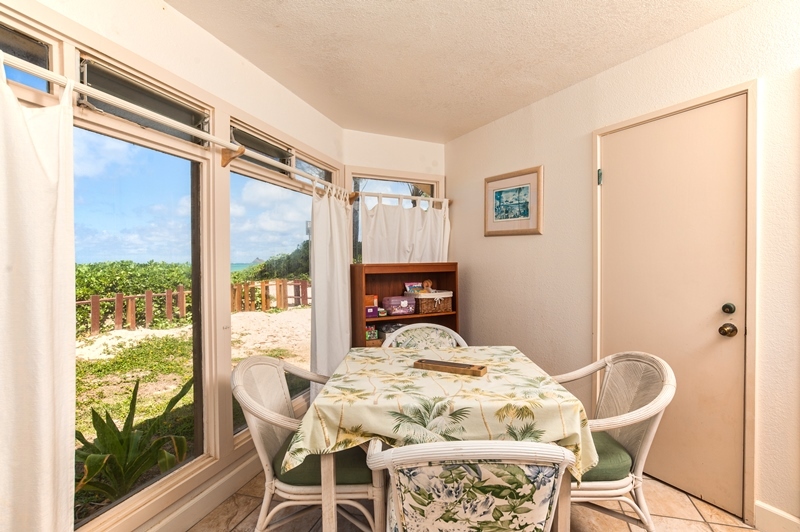 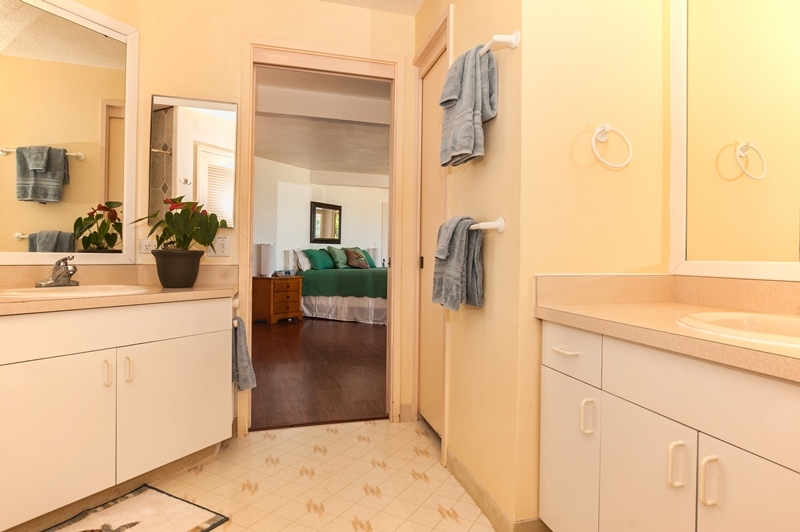 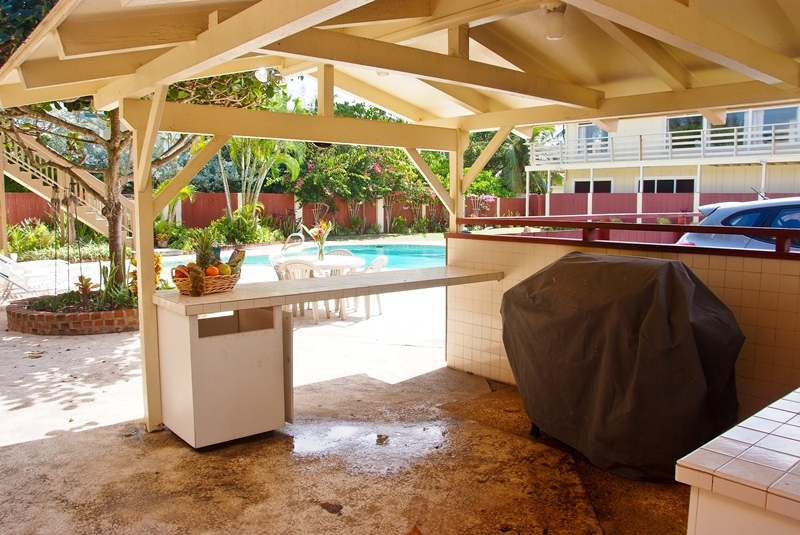 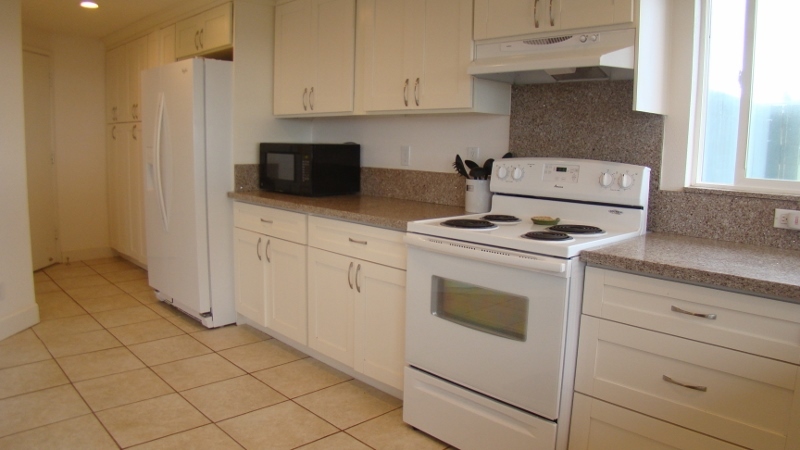 Cottage – 2 bedroom, 1 bath unit with ocean views and a private path to the beach, is located in a separate building outside of the gate, above the caretaker’s quarters. 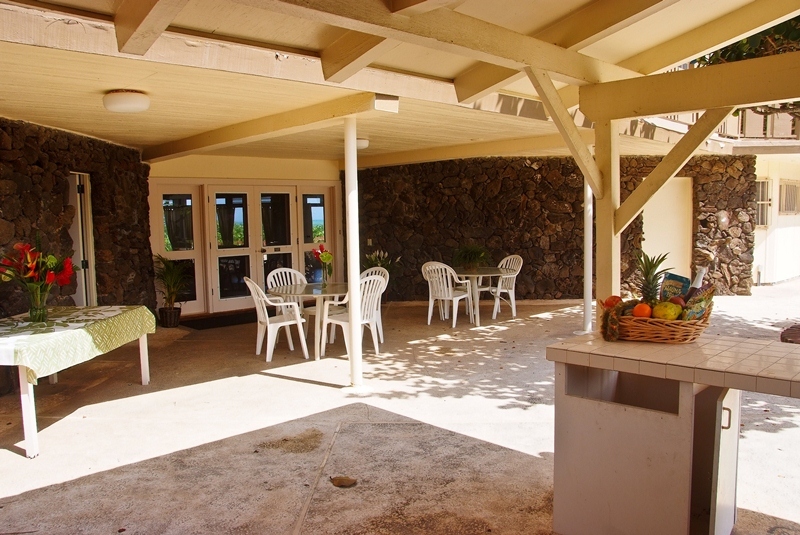 Rate based on occupancy of 16 guests and check-in orientation at the property. 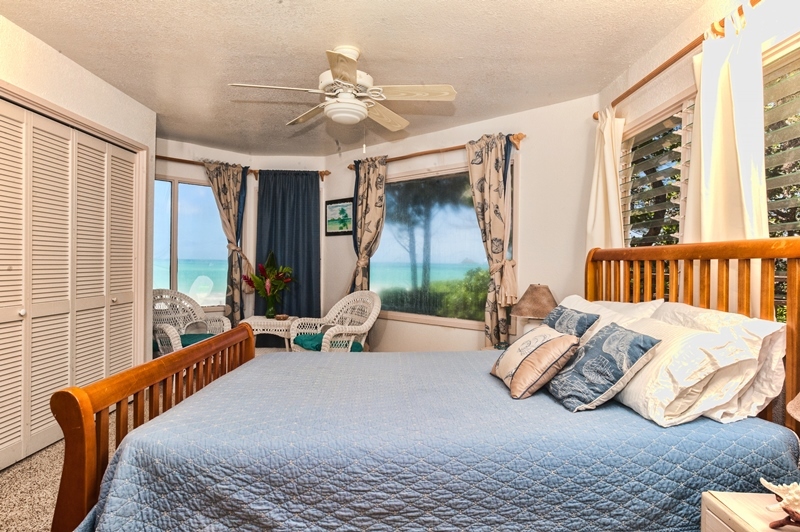 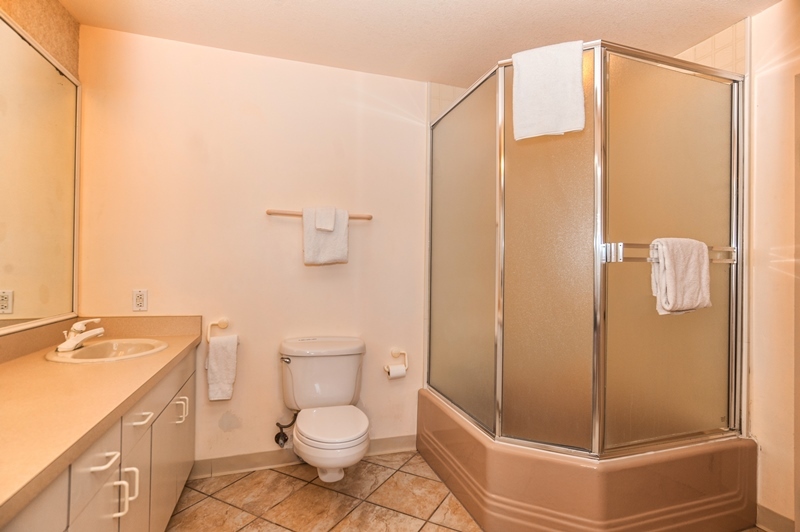 Maximum of 18 guests total (including children age 5 and over) at $125.00 per extra person/per night with approval.